Home » Posts tagged "AGB"
Posted on Sunday, 30 November 2014 by Hipma in Hipma, Press Release. OBSESI IV: Mahasiswa, Wirausaha, dan AEC 2015! Posted on Saturday, 15 November 2014 by Hipma in CCDD, Hipma, Press Release. 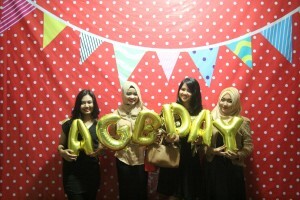 AGBDAY 2014! Junjung Tinggi Sportivitas dan Berkompetisi Sehat dengan Kreativitas! Posted on Saturday, 15 November 2014 by Hipma in B'Hero, Hipma, Press Release. Posted on Wednesday, 05 November 2014 by Hipma in D'Entre, Hipma, Press Release, Uncategorized. Posted on Wednesday, 22 October 2014 by Hipma in D'Soul, Hipma, Press Release.